Delphina selects the best destinations for honeymooners in September in Sardinia. Wellness holidays for couples and Thalassotherapy, excursions and tours to the most romantic destinations in Gallura. The best destinations for an unforgettable honeymoon in September in Sardinia? Gallura is certainly a paradise for couples who want to enjoy romantic moments together and the months of May-June and September-October are the best time for newlyweds who want to have an unforgettable honeymoon by the sea, for those who want to pamper themselves with romantic holidays for two or celebrate a wedding anniversary in an exclusive SPA hotel in Sardinia. All the hotels in the Delphina group have their own heart and soul. The Hotel Relax Torreruja at Isola Rossa, the Hotel Marinedda Thalasso & Spa and the Hotel Capo d’Orso at Palau are the top three destinations for honeymoons in September: marvellous locations by the crystalline Sardinian sea, exclusive services and elegant settings all go to create a truly poetic atmosphere. Are you looking for a romantic and quiet corner for a memorable honeymoon in September? The Costa Rossa is certainly the ideal place for a holiday for two in Sardinia. The whole landscape from Isola Rossa to the bay at La Marinedda conveys delicate and delightful sensations: the cerulean blue of the sea combined with the dark red cliffs especially at sunset all go to create background settings for unforgettable moments spent with your loved one. 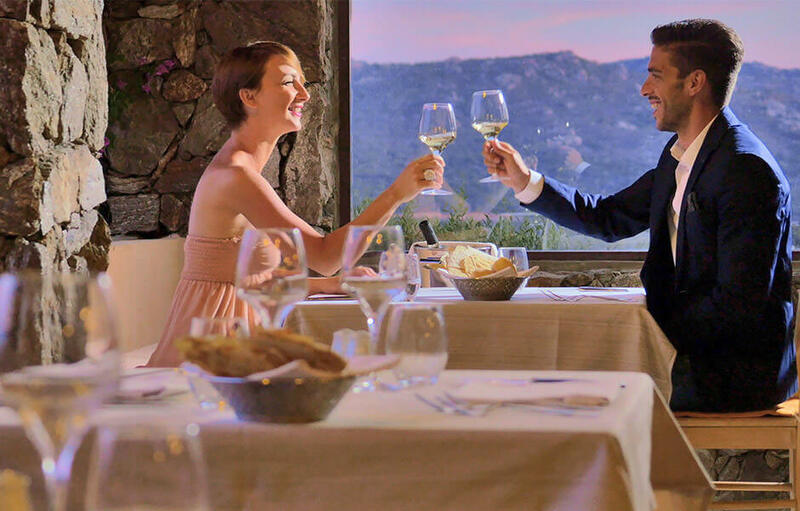 The 5-star Hotel Marinedda is a love nest for couples on honeymoon in Sardinia where you can find privacy but also exclusive services and renowned restaurants that offer a true culinary experience in Gallura. The Hotel Torreruja in the nearby Isola Rossa is an oasis of relaxation for couples, located in the centre of the small village but enjoying a secluded location and with direct access to sundecks over the sea reserved for hotel guests. If you are a couple looking to immerse yourself in a relaxing environment and experience the luxury of the Costa Smeralda, the boutique Hotel Capo d’Orso at Palau is the perfect refuge for you! Romantic suites with sea views, breakfast served in a zen atmosphere while delicate arpeggios welcome the early hours of the day and hidden hammocks in the shade of juniper trees are just some of the pampering features that a spa and wellness weekend in Sardinia in September will give you. All the Delphina hotels for couples boast Thalasso wellness centres well known throughout the North of Sardinia. At the Hotel Capo d’Orso, the Incantu (as the word in Gallura dialect says) is a charm, a revitalizing oasis for the body and soul. So it’s not just holidays by the sea in September then, but unique moments shared with your partner between the seawater swimming pools and wellness treatments with the scent of myrtle and the taste of caviar in one of the SPA’s elegant cabins. Covering 2,500 m2, the exclusive Thalasso Wellness Centre at the Hotel Marinedda is among the largest in the Mediterranean with its Thalassotherapy pools, cabins for specific special treatments and Technogym open 24hs a day. But if you are enjoying a romantic holiday in Sardinia or you are spending your honeymoon in one of the best destinations in Gallura, don’t miss the massage for couples using special scents and perfumes of Sardinia at the Elicriso SPA. 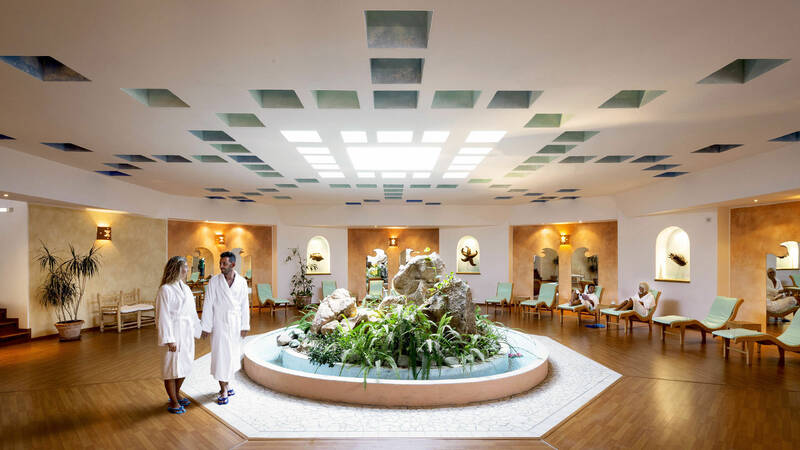 The Wellness Centre and SPA at the Relax Hotel Torreruja can also satisfy every desire. Couples who take advantage of the Emotion package reserved for honeymoons and anniversaries (available in each hotel with different experiences) at the Hotel in Isola Rossa can relax in a Jacuzzi for two while sipping an exotic fruit drink and looking out over the breathtaking panorama. Hotels with different personalities but united by the same love for the territory. All the Delphina hotels in Gallura offer a number of suggestions on what to see in Sardinia in September. The excursions suggested by the romantic hotels in Isola Rossa and Palau will take you on a discovery of the island: ancient nuraghi surrounded by cork trees, typical picturesque villages with delightful traditions and breathtaking landscapes are wonderful experiences to be enjoyed as a couple in Northern Sardinia, and all rounded off with tastings of excellent Sardinian products. Finally it is impossible not to spend at least half a day on a boat trip around the La Maddalena Archipelago or Corsica. With the exclusive Delphina fleet of chartered pleasure craft available just for Delphina guests you can enjoy a 360° experience of the sea in complete privacy and with long stops for swimming in some of the most romantic bays and inlets in the North of Sardinia.